So… the fabulous Sierra White has asked me to share some thoughts on modesty for her Facebook page Ezer Rising (and blog: Ezer Rising), which (if you didn’t know) is committed to sharing content about women’s equality from a Christian perspective. First thing I’ll say is that I’m going to approach modesty in a way that I haven’t seen done elsewhere. Not because other ways are necessarily wrong or flawed, but because different ways of looking at things work for different people. And sometimes a different perspective can help us appreciate things that we hadn’t seen before. Discussions about modesty and modesty culture often start with a false assumption. They assume that modesty is about the body. Well, I have something to tell you: modesty is not about the body. Yes, I know that when evangelical purity culture (and other cultures) make a really big thing about modesty, it’s nearly always in relation to clothing, bodies and bare skin. And I know that it’s usually targeted at women. But. I don’t think that’s what modesty is really meant to be about. Gilderoy Lockhart has to be one of the most immodest people I have ever encountered in a story. When I first read Harry Potter and the Chamber of Secrets he infuriated me: he was loaded with his own ego and self-aggrandised at every opportunity. And he was appallingly incompetent in ways that endangered other people. Later, when I mellowed a bit and knew how the book ended (along with the rest of Harry Potter), I realised that he was a beautifully crafted comedic character: the epitome of vanity and immodesty. What makes him immodest? Well, it’s not revealing clothing, that’s for sure. There are three things he does repeatedly that are immodest: (1) he brags about his magical accomplishments, (2) he brags about his popularity in the wizarding world, and (3) he dresses in a way that displays his wealth and status. Now you might be thinking, “That’s not immodesty, that’s just vanity.” To be sure, Lockhart is totally in love with himself. But his vanity also expresses itself in immodesty. He could have been different. He could have been like Narcissus in the ancient Greek myth; the story goes he was so beautiful that he fell in love with his own reflection and died looking at himself. In this, I reckon Narcissus showed vanity, but not immodesty. So what’s the difference? Simple: vanity is to do with how you relate yourself; immodesty is do with how you relate to your context. So let’s look at Lockhart’s context. He’s a wizard in the wizarding world. In this context, magical competence is a pretty big deal. Being known as a powerful wizard amongst other wizards is also a big deal. Being known as ultra-charming is a big deal for men who like to use that as a way to get women fawning all over them (well, it often is when you’re in a mainly hetero-normative context). So Lockhart isn’t drawing random attention to himself. He’s doing it in very particular ways. He is drawing attention to the things about himself that mean he looks big and important when you consider him in his context. Or to put it another way: Lockhart demonstrates immodesty in how he draws attention to his glory. And I reckon modesty is all about glory. For example: a bird’s glory is not usually to be seen whilst it is on the ground, but whilst it is in the air. But, if you take a kingfisher, its glory is seen as it dives into water and out again – not many birds can do that. Similarly, take a hummingbird: its glory is seen in how it hovers so precisely that it can drink the nectar from a flower. Glory is connected to context. Lockhart has an idea about how to be glorious in a wizarding context. Yes, he’s an incompetent fraud, but that’s not what makes him immodest. Let’s assume for the sake of argument that he could do all the things he claims. What makes him immodest is the fact that he puts his glory on display in ways that are inappropriate. So what exactly makes it inappropriate? It would be easy to say that Lockhart’s immodesty is down to how he’s so self-absorbed and draws attention to himself all the time. But that definition doesn’t quite work. When you see a brilliant performer on stage they are drawing attention to themselves and indeed their glory (or one of their glories). But that performer is not necessarily being immodest. This is not about self-esteem. No, as I said before, immodesty has to do with how someone relates to their context. If we look at Lockhart’s context again, it’s not just that he’s a wizard, he’s also a teacher in a school. His context is one where he should focus his efforts on encouraging and empowering his students for their development – but he doesn’t. Instead, he repeatedly puts himself (not his students) at the centre of everything. And he does so in ways that put himself above others. In other words, I reckon immodesty is about showing your glory in a way that is inherently excluding of others. 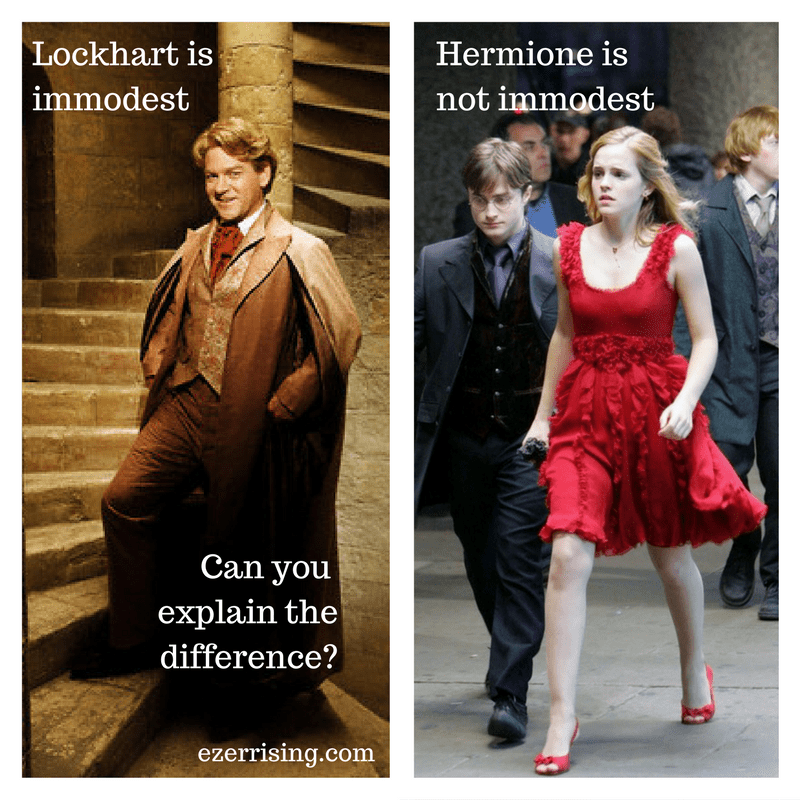 EDITED TO ADD: This is why I wouldn’t describe Hermione as being immodest in her fabulous red dress. Her context was that she was at a wedding, where everyone gets to dress up. Yes, she is showing (part of) her glory, but it’s not in a way that excludes others. If she’d been out-dressing the bride, well, that would have been a different matter. 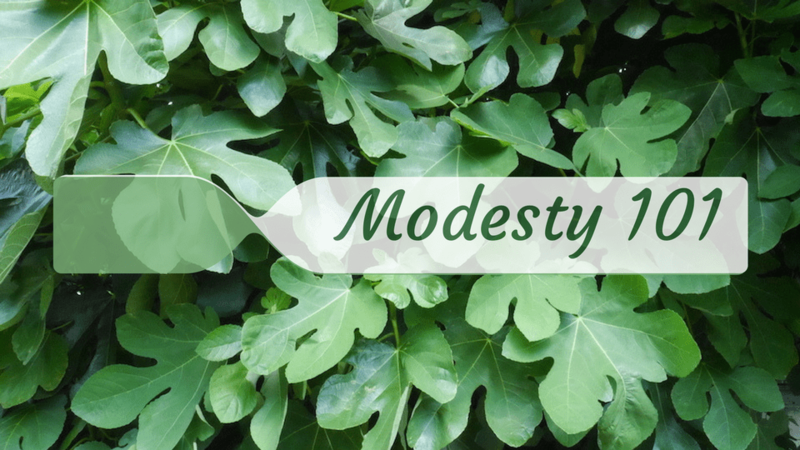 Is modesty simply lack of immodesty? As human beings, we have many different glories. Some of our glories are deeply connected to our bodies and therefore our identity – our faces, the colour of our hair and even the colour of our skin. Thing is, we need these parts of ourselves to interact with other people, so it’s often unavoidable that they’re on display. Also, because many other people share in a similar glory (albeit with differences), this usually means (though not always) that to show these parts of our identity and glory isn’t exclusionary. We also have other, less obvious, glories that are associated with skill – and these may be just as important to our identities, but they aren’t as obvious to the wider world. For example: how we are able to use words, how we are able use our voices and our bodies, how we can be creative, how we have knowledge of specialist subjects. Most people who have these glories don’t exhibit them all the time because they know to do so would be immodest. It would be alienating or excluding of others. So in my book, putting your glories and privileges on display is immodesty when doing so is inherently excluding of others. But I don’t think that being discreet necessarily makes a person modest. At its best, modesty is more than that. I believe that modesty is about veiling your glory as a means of inclusion. This might seem a weird definition, but one of the things you’ve got to understand about modesty is that it’s about hiding something. That means when modesty is done well, it’s easy to miss. I would say a person is truly modest (rather than the double-negative “not immodest”) if they’re in a context where, actually, they have a right to put their glory on display. I find it hard to name other clear examples from my experience or popular culture (which probably tells you something about the media). But there are two rather blatant examples in the Bible, so I’ll comment on them instead. In Exodus 34:29 we read the story about how Moses went up on Mount Sinai to speak with God and how when he came down, his face was shining with the glory of God. To begin with, Moses didn’t realise his face was radiant. However, the people were terrified so Moses wore a veil to cover his face until it returned back to normal. In other words, Moses veiled his glory as a means of inclusion. Of course, what Christians believe Moses was doing (amongst other things) was to ‘act out’ in some way what Jesus would later do. As Paul explains in Philippians chapter 2:5-8, Jesus had equality with God – he had glory with God, but he put it to one side and entered the earth in human form. Entered our world, your glory veiled. Noel Richards does similar in another Christian worship song called You Laid Aside Your Majesty – and the title is enough to make my point here. In other words, Jesus was modest. There is of course, the one time when Jesus unashamedly unveils his glory. I’m not talking about in a miracle where he healed someone or saved someone – though Jesus showed his glory in certain ways in those moments. No, I’m talking about a display where Jesus shows he is made of awesome: the transfiguration (Matthew 17:1, Mark 9:2, Luke 9:28). Jesus went up on a mountain and his face started shining like the sun and his clothes became bright. And Peter, James and John were with Jesus and they were beside themselves with fear. And this brings up loads of questions. When do we unveil our glory? For what purpose? How much do we have to weigh in the feelings of other people? What’s the difference between ‘being’ glorious and ‘displaying’ our glory? If modesty is about ‘veiling glory’, then why do so many people associate it with hiding shame? Is the body glorious or shameful? Are parts of our bodies ‘unpresentable’? What do we make of 1 Corinthians 12:23? Edited to add: I initially published this here because the Ezer Rising blog was still a work in progress, but future posts in this series will be published there. You can find the first one here. You can also use the modesty tag on that blog to find future posts. If you’re interested in further reading, Bailey Steger ran two posts relating to this. The first, I don’t accommodate uncontrolled men went a bit viral and she followed up with another one Consent, Context and Clothes which takes some of the ideas in this post and applies them.